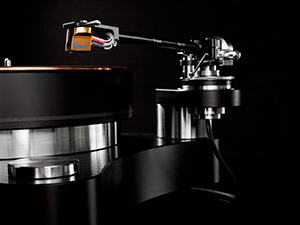 TW-Acustic - The best for your vinyl. They have set themselves the highest standards and tightest tolerances for the manufacture of their products. The Black Night portrays the music’s every detail with subtlety and stereo depth, whether it be human voice or instruments. Everywhere, you'll discover nuances that had previously remained hidden. Attack and decay of transient notes are reproduced impressively. The Raven Black Night is incredibly musical, its spatial presentation is so three-dimensional and tangible that the music is always reproduced with the utmost authenticity. 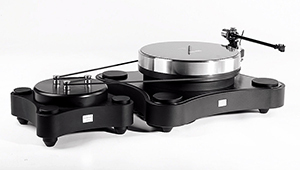 As with the Raven AC, the Black Night also provides for the use of up to four tonearms. 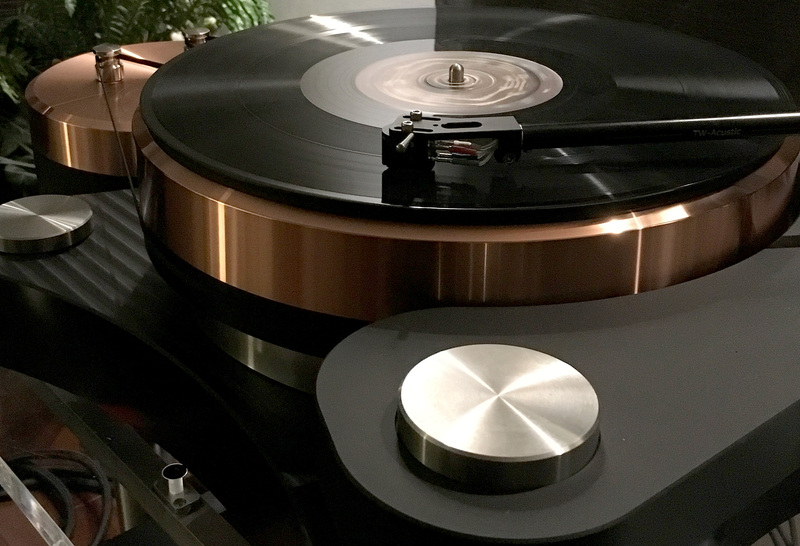 Raven Anniversary Turntable - Our Reference! Their Jubilee Edition is Our Reference! 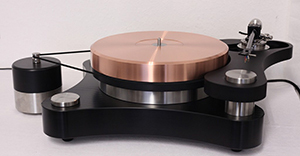 The Anniversary represents a new statement in turntable manufacture. It is based on the Raven AC chassis, machined from our well-known proprietary custom compound with a screwed-in stainless-steel plate. The Anniversary's platter is a composite construction consisting of 40mm thick copper fixed to a 20mm thick slice of our proprietary compound and basically equal to that of the Black Night. The Anniversary lets the music flow, yet remains composed and pairs dynamics with incomparable transparency. It is rare in this class to experience such resolution and dynamics in music. With the Raven AC Anniversary we bring you a big step closer to the ideal of real high fidelity musical reproduction. The AC version of the Raven has a modified motor control. The armboard is made from bronze as standard. Feet: three, ceramic bead blasted and silk matt black anodized aluminum, designed and built by TW ACUSTIC featuring ball and spring suspension. A significant update is the provision of a new motor control unit. This is even better than its predecessor and is designed to provide support for the three-motor drive option. We have taken the exceptional properties of copper, and in conjunction with our special polymer we have developed a compound platter. The musical reproduction benefits from breathtaking soundstaging and stereo depth, the representation of the instruments gains substance. The whole sound characteristic becomes clearer and more relaxed. The newly-developed Raven GT is not simply there to fill the gap between our base model the Raven One and the classic Raven AC. It incorporates knowledge and experience that we have made over the years. 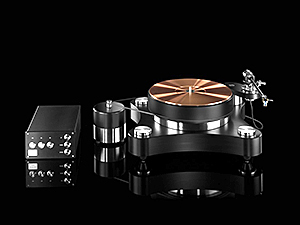 The primary aim was to be able to offer a compact turntable which could run two tonearms without any sonic compromise for a reasonable price. The rigorously selected precision bearings are ultra-precisely adjusted during the production process in order to eliminate any interference in the pick-up process through stiction. 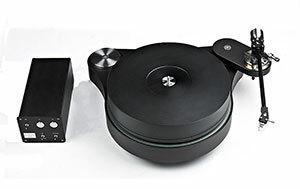 To keep effective mass to a minimum, the tonearm is predominantly constructed from a special black- anodized aluminum alloy which intrinsically ensures the necessary stiffness and torsional strength. The effective mass is approximately 14g, which allows partnering with the majority of currently available MC and MM cartridges. This universal compatibility is further underlined by the inclusion of three different polished stainless steel counterweights as standard, allowing any cartridge with an operating weight of between 5g and 20g to be perfectly counterbalanced.